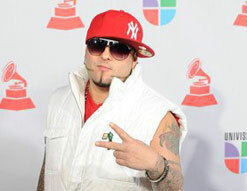 DJ Kane is the original lead singer of the popular group Los Kumbia Kings. Los Kumbia Kings have had numerous chart topping singles and sold several million copies of their six studio albums before disbanding. The group also featured well known Mexican singer Frankie J. DJ Kane has also seen tremendous success as a solo artist. In 2004, he released his self titled first album DJ Kane which went to number 8 on the Billboard charts while also earning two Latin Grammy nominations for Best Urban Album and Producer of the Year. DJ Kane has also once again hit the top tier of the Billboard charts with two subsequent solo records. Now with “Siempre Conmigo” taking the lead single position, this Latin megastar is ready to get people grooving once again. “Siempre Conmigo” translates into “Always With Me” from Spanish. This feel good mid-tempo saucy and groovy number is a sweet mix of rock n roll and Latin pop. The song is filled with warm and slicing guitar riffs and, of course, DJ Kane’s flawless vocal delivery that rests somewhere between Enrique Iglesias and Garth Brooks. Yes folks, this is a voice that truly deserves the official recognition it has received over the years, and it shines here with every line. If there is one stereotype that Latin Americans proudly bear, it’s that the men are handsome and the women are simply incomparable. The videos follows the breakup of a young couple who simply seem to gorgeous for each other. However, at the last moment of the clip, they both realize that everything they’ve gone through is part of the very thing we call love. If ballads are more your thing, the “Es A Ti” has your name written all over it. This gentle number tames it down on the instruments so DJ Kane can show off his vocal chops once again. As he croons, manipulates vibratos, and changes ranges faster than a rushing driver changes lanes, DJ Kane delivers an almost R&B style number that will certainly get almost anyone with ears in the mood. The video once again features a couple that is more than easy on the eyes. This time the situation is quite different – the man is having a rough time focusing on his work because all he can think of is his gal. Fortunately, she has the same thought on her mind, and the couple has a steamy rendezvous in a nearby hotel. We are truly honored to be representing such a well known artist in the Latin music world. The staff at Ramomar have provided us with lots of DJ Kane goodies for giveaways and contests, so be sure to let us know and we will help make it happen. If you need more info, call Andy Gesner at 732-613-1779 or e-mail us at HIPVideo@aol.com. You can also visitwww.Facebook.com/jkanemuzik to find out more about DJ Kane.